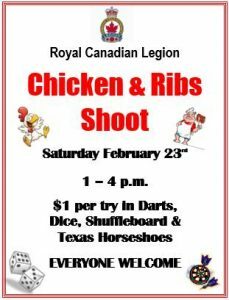 The Royal Canadian Legion presents: Chicken & Ribs Shoot. Saturday, February 23, 2019 at 1:00 pm - 4:00 pm. $1.00 per try in darts, dice, shuffleboard and Texas horseshoes. Everyone Welcomed! The Atikokan Naive Friendship Centre welcomes you to join us! Open Sweat Lodge & Feather Teaching. 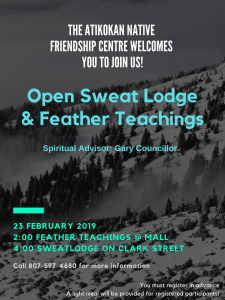 Spiritual Advisor: Gary Councillor February 23, 2019 2:00pm Feather Teaching at the Mall 4:00pm Sweat Lodge on Clark Street Call 807-597-4680 for more information. 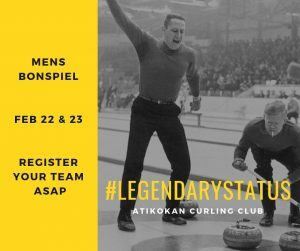 You must register in advance. A light meal will be provided for registered participants.